D. Brooks Welding Co. was among the companies that worked on the memorial between the Washington Monument and the Lincoln Memorial. The small company of six employees shaped the pipes that form the ellipse housing the water jets in the memorial's fountain. "We're very fortunate to do this job," said Mike Brooks, owner of the company. Mike Brooks, left, owner of D. Brooks Welding Co., holds a piece of pipe as Jay Green measures it Monday. 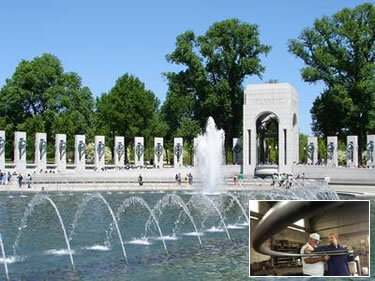 The company bent 640 feet of 10-inch stainless steel pipe for the fountains in the National World War II Memorial. The company was contacted by another company working on the project, Hobbs Architectural Fountains in Atlanta, to do the work as a subcontractor. Three workers at Brooks Welding bent the pipes in Birmingham to form the ellipse, which is almost as large as a football field, said Brooks, 62. Workers in Washington installed the ellipse in the fountain. The general contractor for the project said he was pleased with the pipe work. was done in the time frame we needed. All in all the piping on the project was very successful." The memorial, funded almost entirely by private contributions, was authorized by Congress in 1993, according to the memorial Web site. Tompkins/Grunley-Walsh was awarded the $56.1 million construction contract in 2001. Construction began on the bronze and granite memorial in September 2001. The memorial opened April 29. Working on a project that honored World War II veterans was a special treat for Brooks. "For some reason, ever since I was just a kid World War II fascinated me ... ," he said. Brooks said he plans to see the memorial in person sometime after the dedication ceremony. "When you've got (your work) between the Washington Monument and the Lincoln Memorial, that's something," he said. The project also highlighted the company's unique work, which has allowed it to carve a niche in the industry. While there are companies that bend metal beams for curving architectural designs, most of these companies prefer to subcontract smaller scale work such as pipes, Brooks said. D. Brooks Welding Co. is one of the few companies doing such work. This has allowed the company to do work all across the nation for malls, resorts, Universal Studios in Orlando, Fla., and Disney World. Brooks' office at the small white brick shop on 12th Street North is decorated with photos of curved metal pipe work forming ornate mall entrances and canopies. The company was started in 1948 by Brooks' father, D.E. Brooks. 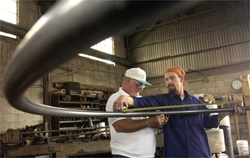 The company acquired a pipe bending machine, known as a Mandral Bender, and has garnered a reputation in the industry. The key, Brooks pointed out, is to bend the pipes in large sections that require minimal welding when installed. "It's a niche, no doubt about it," Brooks said of the work. The company's reputation in this industry has helped it receive a fair share of subcontractor work. Whitefab Inc., which bends large material such as beams, often subcontracts pipe work to the company. "He's good at what he does," said Monroe Fields, president of the Birmingham company. "He's a person of high integrity."